Whether you’re selling auto parts, toys, fine art, or land, eBay can work for you. But first, you have to find your niche. Sounds easy enough. After all, deciding where to put your stuff for sale on eBay is straightforward, right? Not necessarily. The task is complicated by the inclusion of thousands of categories on the eBay category-overview page, which you get to by clicking the Categories button in the eBay menu bar. To see item counts for each category, click the See Item Counts link in the lower-right corner of the page. Consider the example of a Harry Potter toy. Harry Potter toys are hugely popular. The easy choice is to list the item under Toys & Hobbies→ TV, Movie, Character Toys→ Harry Potter. But what about the category Collectibles→Fantasy, Mythical & Magic→Harry Potter? This is the point where you must decide whether to list in two categories and pay double or count on the fact that your beautifully keyword-laden item title will drive prospective buyers who use the search engine directly to your item. Keywords are single words that are used to describe the content of the online listing or web page. Search engines use them to find your eBay listing or to classify your web pages when they come up in a specific search. Adult-oriented items cannot be listed in any category outside eBay’s Adult Only section. But you can list your item in any two subcategories within that section. DVD, HD DVD & Blu-ray. Listings with variations: Some categories on eBay permit you to list variations of an item. If you select a second category that doesn’t allow variations, you won’t be able to create a listing with variations. Perhaps you aren’t selling Harry Potter toys. Suppose you’re selling a DVD of the movie The Red Violin. Would listing it in DVD & Movies→DVD be the right choice? Or would you reach an untapped audience of category browsers in the Music→Musical Instruments→String→Violin? The popularity of categories varies from time to time. News stories, the time of year, hot trends, or whether Paris Hilton makes a comment about something can change a category’s popularity in a nanosecond. How can you possibly know the best category for your item? 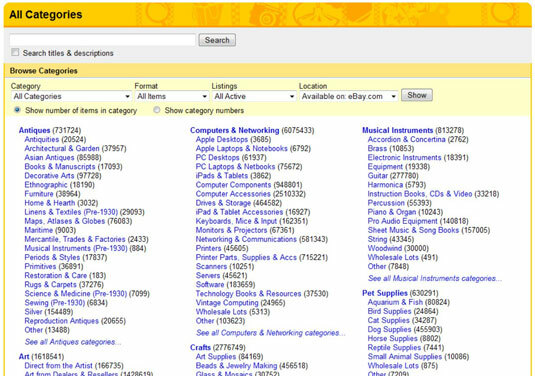 Research your items regularly using the awesome eBay search engine. After you’ve been selling a particular item for a while — and doing well with it — selling it in a different but related category can boost your sales. A little research now and then into where people are buying can go a long way to increasing your eBay sales.